After two years of battle, the Ohlone campaign to protect the West Berkeley Shellmound and Village Site suffered a surreal setback last week as the developer invoked a brand new state law that takes control of housing project approval away from local zoning boards and city councils and requires “over-the-counter” rubber stamp approval by planning departments. By meeting a formula that designates half of the units as “affordable housing” the 1900 4th St. developers have redesigned the project to fit the requirements of SB 35, which went into effect in January. 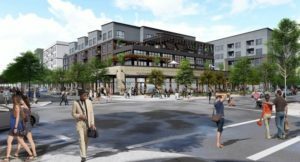 A threatening 12-page letter to the City of Berkeley essentially said approve the project within 180 days or face a lawsuit. The press release announcing the plan went out 20 minutes before the press conference, and the event was staged in Emeryville, not Berkeley. 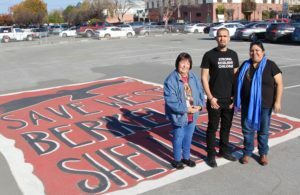 Lisjan Ohlone leader Corrina Gould is leading the fight to protect the West Berkeley Shellmound and historic village site at 1900 4th St. in Berkeley. Strawberry Creek once flowed right through this land. Where the freshwater creek met the saltwater bay, Corrina’s ancestors started the first village around what is now called San Francisco Bay roughly 5,700 years ago. Living off abundant oysters, clams, abalone, mussels, crab and salmon, a massive shellmound grew within the village and was a center for ritual burials and ceremony. Ohlone prayers are offered at the village/shellmound site to this day. Corrina is spreading the word about the cultural history of this important site and seeking community support to protect this designated Berkeley City Landmark, which is eligible for the National Register of Historic Places, and restore it as an environmental, educational and ceremonial space. This historic cultural place is the proposed site of a five-story condominium and retail complex (just north of University Avenue and east of the train tracks). It is a sacred place that has been protected for decades under the asphalt of Spenger’s Fish Restaurant’s two-acre parking lot. Two ancient burials were disturbed by trenching just across the street at another development in 2016. Developing the site would involve digging down 8-feet over the entire 2.2 acres and removing everything for disposal elsewhere. 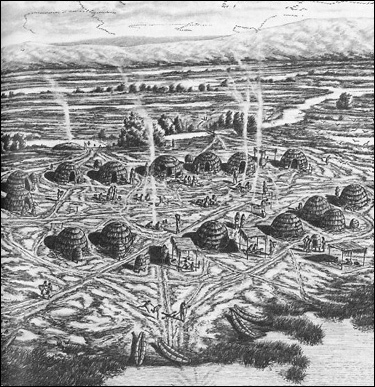 Though the developer claims the shellmound was located a few feet to the west and that most of the site was wetlands, maps are inconclusive, and native people point out that the entire shellmound-village-wetland-creek ecosystem comprise a sacred, cultural landscape that moved and evolved over five thousand years. The weight of shellmounds pushes much of the material down below grade into the wet, soft earth below. A growing chorus of Ohlone descendants and Berkeley residents are calling for a memorial park, a two-acre green space to honor Ohlone history and culture, both past and present. The new move by the developers threatens to totally bypass the ongoing community process and to short-circuit established review procedures. The traditional Environmental Impact Report process would be abandoned and there would be no public input before the Zoning Board or Berkeley City Council. Information about the site can be found here: West Berkeley Shellmound Facebook Page and Indian People Organizing for Change (IPOC). Media coverage to date is listed below. Read more about about the recent desecrated burials near this sacred site in my previous blog post. 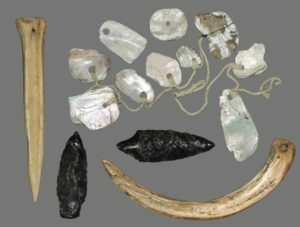 On April 7, 2018 at the Berkeley Art Museum, the Hearst Museum will display 30 Ohlone cultural artifacts that archaeologists dug out of the West Berkeley Shellmound in the early 1900s and 1950s. Native artists will be on hand to discuss what we are seeing. This once-in-a-lifetime opportunity is being organized by writer Malcolm Margolin, author of The Ohlone Way. Do City Council Resolutions Matter? They should. Below are six relevant resolutions passed by Berkeley City Council at the recommendation of the Peace and Justice Commission. Thank Your for Comments on the draft Draft Environment Impact (EIR)! Many letters endorsed the Alternative “Ohlone Memorial Park Open Space Concept.” This vision was presented by Ohlone leader Corrina Gould to the Landmarks Preservation Commission on February 2, 2017 and will be released to the public after the Ohlone community discuss it internally and the concept is developed further. Read about it here. On March 9, 2017, Chochenyo Ohlone leader Corrina Gould made a presentation to Berkeley’s Zoning Adjustments Board (ZAB), which had taken three rounds of public comment already. 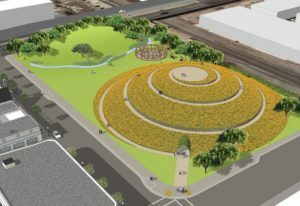 With more than a hundred supporters behind her, Corrina presented the alternative vision for the memorial open space park on the site. (Concept aerial is at right.) Under standard procedure it would be the ZAB commissioners who vote to certify and approve the final EIR, or deny the project. Normally, that decision would then be appealed by “the losing side” and the City Council would have the final say. That process has been circumvented by the developer’s new strategy invoking SB 35. A habitation site of the Chochenyo Ohlone people from 3700 BC to 800 AD, the “West Berkeley Shellmound” is the oldest of more than 425 shellmounds that once rose on the shores of San Francisco Bay. Originally, what is now Spenger’s parking lot and the surrounding blocks were at the Bay’s edge. It’s no wonder the Bay Area’s first people chose this spot to settle: it is where Strawberry Creek flowed into the Bay, the village sat directly opposite the Golden Gate, and shellfish were abundant. Over 45 centuries, spanning hundreds of generations of Ohlone families, a mound of discarded shells grew to more than 20 feet in height and several football fields in width and length. The people lived, worked, played with their children, conducted ceremonies and buried their dead here, a true homeland. In 2002, the site was designated a Berkeley City Landmark. In 2003, it was found eligible for the National Register of Historic Places. In 2004, California recognized the village site as eligible for the State Register of Historic Places. Now, a coalition of native and non-native people is working to ensure this sacred site’s future as a memorial green space park for the ancient founders of the Bay Area. Please join us in recognizing and honoring this site and protecting it from further development projects. For more information visit Indian People Organizing for Change. Archaeologist Christopher Dore’s comment letter on the Environmental Impact Report is excellent.